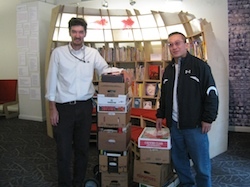 Officer Tommy Yung of the Boston Police Department stopped by on his day off to donate eight boxes of books. Officer Yung patrols the neighborhood on bicycle, and he has already met with staff to coordinate public safety around the library. He will be swinging by regularly as part of his work in the neighborhood. Thank you Officer Yung!